Free Commercial business Delivery or Truck Terminal Pickup within this area. 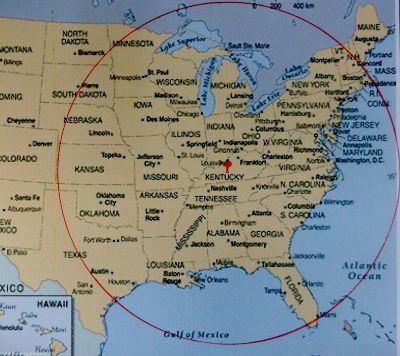 If you are outside this area, Please call 1-866-528-3323 for a accurate Shipping Quote. 1. When you purchase and you are within our 1000 mile Free Shipping Area, Truck Terminal shipping or Commercial Business Delivery is included in the product cost. To determine where many of the Truck Terminals are located in your area, just click HERE or call Toll Free 1-866-528-3323. 2. If you need extras services at delivery, the following can be provided: 1.Farm/Residential delivery $50 2.Hydraulic Lift Gate $75 3.Carrier call you to set a delivery appointment $15. Just put a check in these boxes that are provided with each implement listing on this website and we will take care of it for you. 3. Here is how a Commercial Business is defined by the freight carriers: It must be 18 wheeler accessible and Listed in the local phone book with normal 8-4 business hours and staffed with offload capabilities. 4. Unfortunately, the freight carrier does not consider a farm to be a business. There is a Residential/Farm charge for them to go to the farm, church, school, construction site, military base, marina or other limited access delivery areas. 5. Freight carriers do not offer free calls prior to delivery. Freight carriers do not offer free lift gate service. Freight carriers do not allow the truck drivers to help offload. If you change the shipping address after the freight is picked up, they will charge you for re-routing while in transit. The big trucks hauling your implement will only deliver to a 18 wheeler accessible address. The 75 Ft long rig must be able stay on a hard surface. (no turning around in the field or barnyard) . 6. If you can't ship to a Commercial Business or pickup at the Truck Terminal, A lot of our customers will have us ship to a friends Commercial Business. 7. For your convenience, smaller implements and parts will ship via UPS or USPS Ground to your door. We are limited to under 120 lbs. 8. Some locations shown inside this "Free Shipping Map" may require additional shipping fees. Examples of these locations are Islands, Peninsulas and very remote locations. It is our obligation to contact you if there is any changes in changes and get approval from you before the item is shipped.